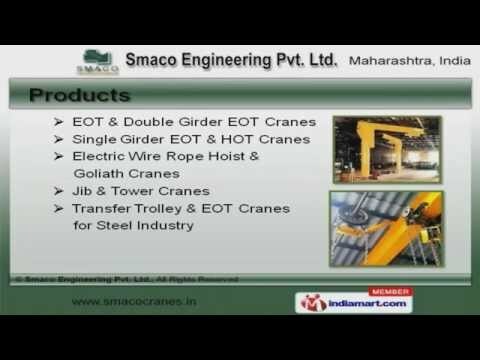 Welcome to Smaco Engineering Private Limited, Manufacturer and Exporter of Material Handling Equipment. The company was established in 1990 at Navi Mumbai. Our products are applicable in refineries, nuclear power plants and other sectors. Client oriented approach and excellent storage capacity help us to serve Clientele like Indian Navy, Irrigation Department and Hindustan Petroleum Corporation. We offer a vast range of Double Girder EOT Cranes, Electric Wire Rope Hoist and Goliath Cranes. EOT and Double Girder EOT Cranes offered by us are in huge demand across the global markets. Single Girder EOT and HOT Cranes are one of the best in the market. Electric Wire Rope Hoist and Goliath Cranes are widely demanded in the market. Our Jib and Tower Cranes are well known for their impeccable performance. Transfer Trolley and EOT Cranes for Steel Industry are setting a benchmark in the market.